Some of my fondest memories growing up are the times I spent at the local arcade. Hours upon hours shooting skeeballs, and wasted quarters in everything from The Simpsons Arcade Machine to Operation Wolf. Arcades, like many things, are unfortunately a thing of the past. So, when the trailers for “Wreck it Ralph” came out, I was ready to ride the nostalgia roller coaster to whatever story Walt Disney Animation Studios had cooked up for me. 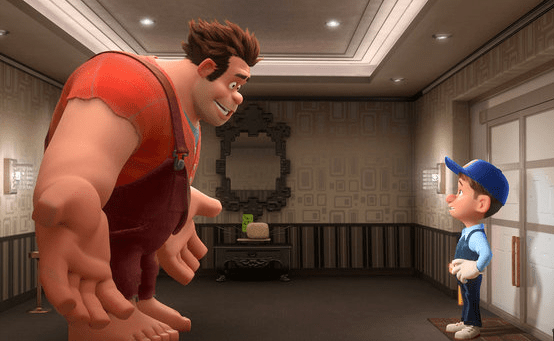 Wreck it Ralph, much like Toy Story, starts with the idea that the characters in Arcade Machines have a life beyond being games people play with. Upon their creation, the characters in the game are there to do the task they were programmed to do, and when the arcade closes, they are free to fraternize, and even grab a beer in the Arcade Game “Tapped” (a beer pouring video game). Ralph, voiced by John C. Reilly, is the “bad guy,” in a game called Fix it Felix Jr. Ralph wrecks the residential high rise, and the player, controls Felix Jr. (Jack McBrayer), to, “fix” the high rise, and eventually toss Ralph off the top floor of the complex. We learn that in this world, characters known as bad guys, aren’t actually bad, and because of their roles, have a lot of things to deal with emotionally. They meet at group therapy sessions to discuss their challenges, and how they deal with them. Just like anyone, they seek to be accepted for who they are. Ralph, tired of no one believing he’s capable of doing anything good, and winning a “medal” like Felix at the end of every round, sets out to get one of his own – in one of the other games in the arcade. His adventure leads him to a racer game called Sugar Rush, where he runs into a glitchy little girl named Vanellope von Schweetz (Sarah Silverman), who he can either help to reach his goal, or return back to Fix it Felix, empty handed. The animation style is unique, and they do a good job of melding more modern games, with retro inspired games like that of the main character. They did a great job at the design of Fix it Felix, really making it feel like something that may have actually existed. I wasn’t fortunate enough to see some of the cabinets the game put out for promotion in theater lobby’s, but you have to admire the care Disney took in the marketing of this film. The film is filled with countless references, and many characters together for the first time on screen. From the likes of Q-Bert and Ryu from Street Fighter, to Bowser from Nintendo’s Mario games. The film earns credit just for pulling off the licensing alone! The voice casting is excellent, and the story unfolds in such a way that there are twists and turns to keep people of all ages hooked till the end. Wreck it Ralph is Director Rich Moore’s first animated feature as helmer, having cut his teeth on quite a few films over the years. He shows that he has the ability to create an entertaining and touching film that is able to be enjoyed by all ages. I genuinely enjoyed the story, and while its not as perfect a film as Toy Story, it pulls at similar heartstrings. If you have fond memories of the arcade, I definitely urge you to get out and check this film out, you won’t leave disappointed.